Gathering in the large, first-floor south meeting room at Town Hall starting at 7:30 pm Wednesday, October 14, the Advisory subcommittee on planning and regulation heard two articles for the fall town meeting, scheduled for November 17. Subcommittee members found that Article 12, offered by member Lee Selwyn to revise the meaning of “habitable space” under zoning, needed substantial review. They proposed referring the article to a committee to be appointed by Edward “Sandy” Gadsby, the moderator of town meeting, and Mr. Selwyn agreed. Park land for Putterham neighborhoods: The subcommittee took a similar approach to Article 15, from petitioners led by Regina Frawley, a Precinct 16 town meeting member. However, circumstances are different. Convening a special review committee is actually what Article 15 asks for. It represents a long detour, starting from an article approved at the May 26, 2015, annual town meeting. In Putterham neighborhoods–the southernmost parts of Brookline–as Ms. Frawley argued last spring, there is little public open space. During years of the Great Depression, when much development in those neighborhoods was underway, Brookline did not acquire park and playground land, as it had done earlier in other parts of town. The only sizable areas remaining as potential recreation space are the so-called “buffers” on the north side of Hancock Village. Following development concepts worked out with the Brookline Planning Board during 1945 and 1946, when the John Hancock Mutual Life Insurance Co. developed Hancock Village, it left unbuilt land adjacent to single-family houses along Beverly and Russett Rds. Since then, that land has often served informally as recreation space for residents of Hancock Village, as well as those of nearby streets. The Hancock Village buffers soon came under attack. First the Hancock Co., in the 1950s, and then the next owner–the Niles Co.–in the 1960s, applied to turn the buffers into parking lots. The apartment zoning approved at the 1946 annual town meeting had left the buffers part of the large single-family zone to the north, which does not allow parking lots. The Zoning Board of Appeals turned down the applications. Recent perils: More recently, the current owner–a subsidiary of Chestnut Hill Realty–has proposed to build both parking lots and more apartments on the buffers. The proposal, approved by the Zoning Board of Appeals last February, draws on provisions of Chapter 40B of the General Laws to override zoning in return for partly subsidized housing. The current Board of Selectmen and its predecessor opposed the Hancock Village 40B project, although neither has been successful so far. The predecessor board–including Kenneth Goldstein and Betsy DeWitt–sued the Massachusetts Development Financing Agency for issuing a “project eligibility letter,” allowing the project application to proceed. That lawsuit has been dismissed at both superior court and the Court of Appeals. While considering further appeal of the first case, the Board of Selectmen–now including Nancy Heller and Bernard Greene–is suing members of the Brookline zoning board in Land Court for approving the Hancock Village 40B project. A hostile motion to dismiss is pending in that case, building on the loss by the Board of Selectmen at the Court of Appeals. The Board of Selectmen now looks mired in conflicts around a proposal to use land at Hancock Village for recreation. Besides the two lawsuits, at this year’s annual town meeting, recently elected board member Nancy Heller filed Article 17, promoting changes to the 40B law that would authorize “local elected officials” to make “binding recommendations” on 40B projects. Reviewing recreation land: When this year’s annual town meeting approved Article 18, asking the Board of Selectmen to “study and consider in good faith” taking the Hancock Village buffers as permanent recreation land, almost everyone assumed the board would appoint an independent, expert review committee. However, nothing like that has happened so far. Instead, about a month later, the board sent the Advisory Committee a $15 thousand reserve fund request to hire a consultant, who would work with town staff reporting to the board. The Advisory Committee took note of Massachusetts cases involving conflicts between 40B projects and land takings for other purposes, when refusing to fund a consultant interacting with the Board of Selectmen. While land taking for community uses is possible, even though a 40B project has claims, it must occur in “good faith” and not mainly to block a project. Involvement by the Board of Selectmen in a proposal for Hancock Village land, given their conflicts, looks to risk poisoning the well and defeating an attempt to acquire land for recreation. Recommendation: For the subcommittee, Ms. Frawley briefly reviewed activities related to recreation land at Hancock Village since May. According to her, Melvin Kleckner, the town administrator, opposed an independent committee to review the issues–at first claiming to be “too busy” to meet with her and then, two weeks later, saying he intended to hire a consultant. Mr. Kleckner is a town employee who lives elsewhere, not an elected official of Brookline. Since he was apparently involved in withholding information about a $200 thousand cost overrun during the May town meeting, his relations with the Advisory Committee have become rocky at best. One long-term committee member, reportedly fed up with disrespectful treatment, has resigned from the committee. According to Ms. Frawley, Mr. Kleckner said the issues of recreation land are “too challenging” for mere citizens. Somehow though, over the years, Brookline citizens managed acquisitions of Hall’s Pond, Amory Woods and the Blakely Hoar Sanctuary, plus more than 100 park and playground parcels, without need for Mr. Kleckner’s consultants. Subcommittee member Lee Selwyn recalled the $15 thousand reserve fund request for a consultant that had been rejected, suggesting that a committee may need “paid expertise.” Ms. Frawley said the committee could assess its needs. Stanley Spiegel, the subcommittee chair, said nine messages in support of Article 15 and one opposing it were on record so far. The subcommittee favored Article 15 and recommended approval, in a unanimous vote. This entry was posted in Business, Development, History, Housing, Meetings, Neighborhoods, Parking, Services on October 16, 2015 by Craig Bolon. News spread Wednesday, September 30, that William Lupini, the school superintendent since 2004, will be leaving Brookline schools soon. Dr. Lupini is expected to head Essex North Shore, a county-based district founded in 1913 serving several communities–including Beverly, Boxford, Danvers, Essex, Gloucester, Hamilton, Lynnfield, Manchester, Marblehead, Middleton, Nahant, Rockport, Salem, Swampscott, Topsfield and Wenham. That might involve less time commuting from the North Shore town where he lives. Interim superintendent: The near-term replacement, pending final negotiations, is expected to be Joseph Connolly, since 2014 the interim principal of Devotion School–as he confirmed to the Beacon on Wednesday. Dr. Connolly enjoyed a long career in public-school teaching and leadership before retiring as superintendent of the Stoneham public schools in 2007. His would-be “retirement” was soon interrupted by several interim leadership positions, most lasting about a year. Before heading the Devotion School administration, Dr. Connolly served during 2009 and 2010 as the interim principal of Runkle School, following another sudden resignation. At both Runkle and Devotion, he has been involved in major renovations of Brookline school buildings, now in advanced planning for Devotion. He has also served as interim superintendent of the Gloucester and the Harvard public schools and as both interim school superintendent and interim town administrator in Boylston. Devotion School plans: The 20-member Devotion School Building Committee provided a public presentation and hearing on its plans to rebuild and renovate the school during the 2016-2017 and the 2017-2018 school years. It began at 7 pm Wednesday evening, September 30, in the Devotion School auditorium. The main architecture has been stable for about the past year, since a low-rise, community-oriented option was chosen over somewhat less costly but much less friendly alternatives. It fully preserves the historic center building, opened in 1915, and it preserves the historic, community-oriented site plan, with east-west wings aligned to Stedman St. toward the north and to Babcock St. toward the south. Since the fall of 2014, the new north wing has moved nearer to Harvard St. and away from the playground in back. The new south wing, toward Babcock St., has been stepped away from nearby houses and apartments. Those revisions appeared at the Planning Board review in January, 2015. At that point, a visually appealing tilt to the front of the new north wing also appeared, parallel to sides of the 1686 Devotion House and designed to maintain an open appearance for the Devotion House lawn and the Harvard St. frontage. HMFH, our Cambridge-based architects, are clearly unfamiliar with neighborhood senses of direction and history. They persist in calling the new wings “east” and “west”–much as they persist in calling the historic center structure the “1913 building,” although it opened to the public in 1915. To long-term residents of North Brookline neighborhoods, who typically navigate without compasses, one travels “north” on Harvard St. from Coolidge Corner to the Allston town line. Relocation plan: A major new element in plans calls for Devotion School to be rebuilt and renovated in a single stage of work, with all the students relocated offsite. Upper grades, fifth through eighth, are already at the old Lincoln School on Boylston St. and will stay there two more school years. No other suitable, vacant school property could be found either in Brookline or in neighboring communities. An approach that now seems workable is leasing the building at 30 Webster St., a block from Coolidge Corner and now the Coolidge House nursing care center–renovating it for school uses. The center is slated to close by the end of 2015. The building might serve for at least one more school building project beyond the Devotion School project. A disadvantage is limited outdoor space in the back, not more than around 2,000 sq ft. However, there is parking already available to the public at the Courtyard Hotel next door. 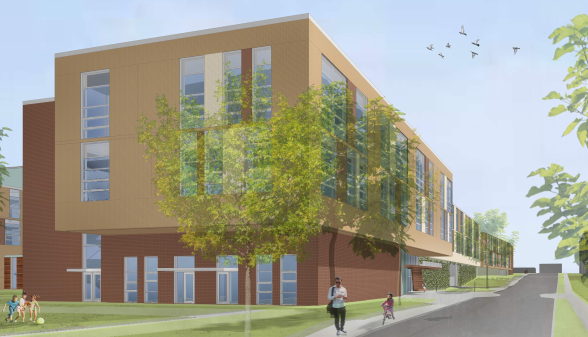 School plans and reactions: Few of about 80 parents and neighborhood residents at the September 30 event had attended previous meetings of the Devotion School Building Committee. Those occurred mostly at 8 o’clock weekday mornings. Except for illustrations published in the Beacon, many were viewing plans to build a new Devotion School for the first time. There were sounds of surprise on seeing a front vista, showing the Devotion House nestled among the historic center structure and new north and south wings. The new wings look lively and contemporary. Because of the choice of a low-rise approach a year ago, they don’t loom over the historic structures, but they do present some contrasts that are not so modest as those from the 1955 south wing and the 1976 north wing. New Devotion School, from above Harvard St. Since last January, the architects toned down initial and highly assertive designs–now showing less glass, more brick, softer colors, more shrubs and trees, and some friendly, community-oriented spaces directly along Harvard St. Philip “Pip” Lewis, chief architect for the project, Deborah Kahn, project manager, and Kathy Ottenberg, landscape designer, described design development and responded to questions. New Devotion School, along Stedman St. toward Harvard St. The usual, everyday entrance will move from a back corner of the current north wing to the side of the new north wing along Stedman St., where now there is just a plain brick wall at street level. 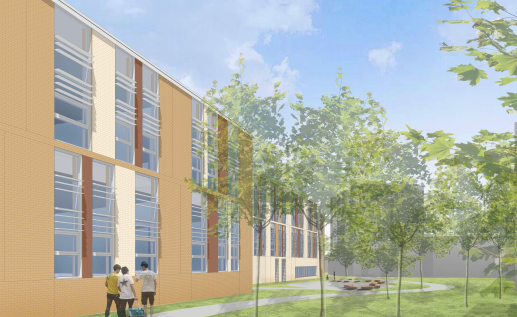 On the east end, toward the playground at street level and just off the new main entrance, will be rooms for pre-kindergarten and perhaps after-school care. Those will also have doors to the playground. New Devotion School, along the side toward Babcock St.
Landscaping along the Babcock St. side has changed considerably since the first plans from September, 2014. Gardening space, intended to support classroom programs, increases from about 200 sq ft now to about 400 sq ft, meeting ADA requirements for handicapped access. Tiers of cedar boxes are intended to support management of different micro-environments. A public walkway between Harvard St. and Devotion St. will feature gently graded ramps instead of steps. Interior plans were previously more developed, even a year ago. Changes have been fewer and less dramatic. Grade clustering of classrooms has been maintained, with kindergarten through second grade on the lower main floor of the new north, Stedman St. wing, with third through fifth grades on the corresponding floor of the new south wing, toward Babcock St., and with sixth through eighth grades on the upper main floor of that wing. Special facilities for science, art and music are on the upper main floor of the new north wing. Core facilities–cafeteria, library, auditorium (now a “multipurpose room”), technology labs and gymnasiums–are behind the historic center structure and mostly between the two new wings. Mezzanine space between the ground floor along Stedman St. and the lower main floors of the new wings houses ventilating equipment and has the utility and storage rooms. Nearly all the new roof space is left available for solar panels. There was one, fairly predictable audience reaction to the exterior design, calling it “boxy, modern and incongruous.” Most reactions, however, focused on open spaces around the new school. Many were concerned about the limited amount of play spaces. Mr. Lewis of HMFH explained that architects had tried to maximize the usability of open spaces, in the face of safety requirements and a larger building area. He said that the usable parts of the playground will actually be larger in total area than they are now. Dr. Connolly, leading the meeting in one his last events as Devotion School principal before he takes over as Brookline’s superintendent, explained how play spaces had been consolidated behind the buildings, “the safest area” of the historic school site. This entry was posted in Environment, Grade schools, History, Meetings, Neighborhoods, Parking, Projects, Services on October 1, 2015 by Craig Bolon. At the Massachusetts Land Court, the Brookline Board of Selectmen faced a motion to remove Town Counsel Joslin Murphy and members of her staff as their representatives in a lawsuit they had filed against members of Brookline Zoning Board of Appeals. It’s a strange case, essentially one town board suing another. After hearing arguments starting at 10:30 am Thursday, September 3, Judge Gordon Piper indicated he would allow the motion unless the Town of Brookline provides its zoning appeals board legal representation in the case before the end of September. Hancock Village controversy: Chestnut Hill Realty of West Roxbury, through subsidiaries, originally proposed building 466 new apartments on parts of Hancock Village in south Brookline. After false starts, they reduced the scope of the project and proposed using powers under Chapter 40B of the General Laws, Sections 20-23, to override Brookline zoning in return for building partly subsidized housing. On February 4, 2015, after more than a year of hearings, Brookline’s zoning appeals board voted unanimously to grant a so-called “comprehensive permit” to build 161 apartments plus 292 parking spaces. There would be a high-rise structure over a rock outcrop, previously considered unbuildable, plus low-rise structures on unbuilt land that had been reserved as “buffers” following 1940s agreements with the Town of Brookline. In a closed session at a meeting March 3, as confirmed by participants, the Brookline Board of Selectmen voted to sue the Brookline Zoning Board of Appeals. A complaint was filed in the Massachusetts Land Court on March 11, seeking to annul and revoke the permit: Town of Brookline and others v. Jesse Geller, Member of the Brookline Zoning Board of Appeals, and others. That became Land Court case 2015-MISC-000072. The Town of Brookline stands directly affected by the permit partly because it owns two abutting properties: Baker School land and D. Blakeley Hoar conservation land. Other plaintiffs in the case are residents who own abutting private property. Main defendants are the zoning appeals board members who voted to grant the permit: Jesse Geller, Christopher Hussey and Jonathan Book–named in their roles as town officials. Other defendants are the Chestnut Hill Realty subsidiary awarded the permit: Residences of South Brookline, LLC. Legal representation: The Board of Selectmen opposed the Hancock Village project throughout 2014 and, so far, 2015. However, that board assisted the zoning appeals board with services of outside counsel, who attended hearing sessions and offered advice. The Board of Selectmen approved several requests to the Advisory Committee for reserve fund transfers to pay for outside counsel. Funds went through both the Legal Services department and the Planning and Community Development department. According to online town records, during fiscal 2014 and fiscal 2015 Brookline paid two firms who advised the zoning appeals board a total of $295,121 for services: Krokidas and Bluestein, of Boston, and Edith M. Netter and Associates, of Waltham. The lawyers who attended the appeals board sessions were Samuel Nagler and Kathryn Murphy from the Boston firm and Edith Netter from the Waltham firm. All testimony and advice was in public sessions recorded by Brookline Interactive Group. At Land Court this week, Judge Piper appeared familiar with the background of the Brookline case. Before arguments, he expressed concern that no legal appearances had been filed for the Brookline Zoning Board of Appeals members and that no counsel attended the hearing to represent their interests. Kevin O’Flaherty, representing Chestnut Hill Realty interests, maintained that Ms. Murphy and her staff had “unwaivable conflict,” responsible to represent two boards with opposing outlooks. The judge asked where there had been practical problems. Mr. O’Flaherty contended there might be problems such as obtaining documents, noting there was no counsel to contact for the zoning appeals board members. Zoning agreement: Jason Talerman, representing other plaintiffs in the case, opposed removing Ms. Murphy and her staff from the Land Court case and noted a related case now pending in the Court of Appeals. A key issue in the Appeals Court case has been a 1946 zoning agreement between the Town of Brookline and the John Hancock Life Insurance Company, specifying enduring restrictions on Hancock Village development. Mr. Talerman had previously raised the issue in a memorandum sent on December 31, 2014, to the Brookline Zoning Board of Appeals. As in that memorandum, under the 1946 agreement, he told Judge Piper, “The project as proposed would be impossible.” In its comprehensive permit, however, the zoning appeals board took no notice of the 1946 agreement. Threat: After more than an hour of argument, Judge Piper seemed unmoved by the particulars and returned to his initial concern over lack of legal representation for Brookline’s zoning appeals board members, saying he found it “deeply troubling.” Board members, he said, were left “entirely speechless, unable to be heard.” Since the members are being sued in their official capacities, they are apparently ineligible to present arguments pro se as plaintiff or defendant individuals might. According to Judge Piper, “The developer,” apparently meaning the subsidiary of Chestnut Hill Realty, “is limited in its ability to gain access to the minds of the [appeals] board…I will not rule at the moment, [but]…if there is continued inability to hear from the board…I will be strongly inclined to allow the motion.” If that threat were carried out, however, it would instead leave both the main plaintiff and the main defendants in the case unrepresented. As acknowledged to the Beacon by Ms. Murphy, Brookline has several sources of funds, including her office’s budget for outside legal services, the contingency fund and “in the worst case” a request to the Advisory Committee for a transfer from the reserve fund. Ms. Murphy did not succeed with her most recent reserve fund request. Mysteries: Partly owing to statements in open court from Ms. Murphy, mysteries remain. There is no docket entry in the case for a communication from Jesse Geller, who chairs the zoning appeals board. If he is ineligible to represent himself in the case yet did “communicate with the court,” then how, when and what did he communicate? Records should say whom the Board of Selectmen asked for advice about a request to provide funds for outside counsel to represent members of the zoning appeals board in the Land Court case, also what advice was offered and what members of the Board of Selectmen had to say. How and why did members of the Board of Selectmen “not authorize any” funds to represent members of another town board with whom they disagreed on a key issue? This entry was posted in Development, Housing, Neighborhoods, Parking on September 5, 2015 by Craig Bolon. A regular meeting of the Board of Selectmen on Tuesday, June 30, rambled into unfamiliar territory, hearing an appeal from a decision of the Brookline Transportation Board. Arguments and discussions about the case took nearly half of a 4-1/2 hour meeting. Last May 21, the Transportation Board had approved building a giant peninsula near the corner where Clinton Rd. branches away from Buckminster Rd. west of the High School. It would bloom out the sidewalk from the northeast sides of Clinton and Buckminster Rds. at the junction, pushing edges of those streets up to 35 feet away from their current alignments. Peninsula at intersection of Clinton and Buckminster Rds. The advertised purpose was to slow cars going westbound on Buckminster Rd. and bending onto Clinton Rd. Past the intersection, Clinton Rd. goes downhill, and cars sometimes reach 40 mph or higher. With the peninsula in place, cars would have to slow at the intersection and then turn right. However, no “traffic calming” had been planned for Clinton Rd., so speeds could rise quickly once past the intersection. Most of the giant peninsula would sit in front of a house at 79 Buckminster Rd., obliterating its streetscape. Owners Michael and Tania Gray are less than pleased. On May 31, they called on the Transportation Board to cancel or radically shrink plans for the peninsula. When that board failed to act, they circulated a petition appealing the case to the Board of Selectmen. Arguments: Although provided for in Brookline’s state enabling law since 1974, appeals from Transportation Board decisions to the Board of Selectmen have been rare. Neil Wishinsky, chair of the latter board, remarked, “We don’t have traditions for how these things are done.” He had decided to hear from the Transportation chair, then the house owners who brought the appeal, then more than 30 residents who came. Mr. Gray painted a different picture, contending that a supposed safety benefit would become a safety hazard in winter, “a place for plows to deposit snow.” Blocked lines of sight could turn a difficult intersection into a dangerous one. On-street parking spaces that are “currently the safest parking on the street” would be replaced by “dangerous parking spaces” along the border of the proposed peninsula. Residents farther down the hill on Clinton Rd. proved less supportive. Most remarks suggested that a pause in speeds at the intersection with Buckminster Rd. would not prevent their part of Clinton Rd. from continuing to be used as “a speedway.” Even Todd Kirrane, Brookline’s transportation administrator, seemed to back those views. He estimated the average speed entering Clinton Rd. at the intersection would be reduced from 23 to 15 mph by the proposed peninsula, not much of a difference. Review and decision: During their review, members the Board of Selectmen sounded sympathetic to concerns of the Grays. Nancy Heller said the proposed peninsula was “harmful to a family.” Nancy Daly said, “I don’t know of any place in town where we’ve stuck something like this in front of somebody’s home.” She was also “convinced that there needs to be traffic calming” downhill along Clinton Rd. This entry was posted in High school, History, Meetings, Neighborhoods, Parking, Projects, Services, Traffic on July 1, 2015 by Craig Bolon. When the Transportation Board held a public review of a recent proposal to rip out all 66 of the public parking spaces on the east side of Babcock Street, between Fire Station No. 5 and Commonwealth Avenue, on Thursday, June 18, it held back. No action was taken, but the proposal from the Bicycle Advisory Committee, appointed by this board, remains on the books and could still be implemented. Threat and insult: So far, the board did not “get it.” Most of its members live in suburban settings. They obviously fail to understand the urban settings of North Brookline and Brookline Center, where nearly half the town’s population lives, and some apparently don’t care. They said nothing. The board’s Bicycle Advisory Committee threatened and insulted the Babcock Street neighborhoods. On June 1, without consulting any neighborhood people or visiting the neighborhoods, they proposed a plan to remove all 66 public parking spaces on the east side of Babcock Street, between Fire Station No. 5 and Commonwealth Avenue, plus 16 potential spaces currently marked “no parking,” to install a bicycle lane. One committee member, Tommy Vitolo, a Precinct 6 town meeting member, dissented. Dr. Vitolo argued against disruption of the Babcock Street neighborhoods. However, he was unable to persuade any other member of this neighborhood-hostile committee. The other members opted to invade Babcock Street neighborhoods with bulldozers, ordering people around and destroying key parts of the Babcock Street social and physical environments. Remedies: Well in advance of the Transportation Board Meeting, Andrew Pappastergion, the commissioner of public works, agreed with Precinct 8 town meeting members to defer work on Babcock Street to next summer. However, no public participation is guaranteed, and so far none has been arranged. A Precinct 8 town meeting member has asked the Board of Selectmen to appoint a project review and monitoring committee. The only long-term remedy likely to prevent a recurrence of this abuse is to dissolve the narrowly focused and irresponsible Bicycle Advisory Committee. Instead of a single-interest group, the community needs a Pedestrian and Bicycle Safety Committee. It would represent the main, human-powered transportation alternatives that need protection from operators of motor vehicles. On June 18, it was not clear that Transportation Board members heard the cadence or the melody. Instead, they appointed a person who came across as yet another bicycle “groupie” to the Bicycle Advisory Committee. The neighborhoods have been patient. They will wait months but not years. They are looking for clear and positive, decisive action. If that does not happen, people will likely say other adjustments are needed. This entry was posted in Environment, Grade schools, Meetings, Neighborhoods, Parking, Transportation on June 19, 2015 by Craig Bolon. Conflicts of interest abound in government: duties to represent citizens, as opposed to private interests. Few political officeholders are immune. Locally and recently, we have seen Brookline residents involved. Deborah Goldberg, a former chair of the Brookline Board of Selectmen who is now the Massachusetts state treasurer, recently disclosed a potential conflict involving her husband, Michael Winter, a J.P. Morgan executive. His firm was awarded contracts to market $100 million in state bonds. Mr. Winter, however, does not work in the company division responsible for government bond marketing. In a local context, Christopher Dempsey of 43 Brington Rd., a Transportation Board member, has an apparent personal interest in a proposal submitted to his board by the Bicycle Advisory Committee, on which his father, John P. Dempsey of 43 Brington Rd., now serves. At an evening meeting on Monday, July 1, the elder Mr. Dempsey argued and voted in favor of a proposal to remove all parking from the east side of Babcock St., from Fire Station No. 5 at 49 Babcock St. to the town line at 1010 Commonwealth Ave., in order to install a lane marked exclusively for bicycle use. That part of Babcock St. now has a total of 66 available parking spaces along a street with many apartment buildings that have no parking. The Bicycle Advisory Committee proposal is scheduled to be reviewed by the Transportation Board at a June 18 meeting. On Monday, June 8, town meeting members from Precinct 8 agreed with Andrew Pappastergion, the public works commissioner, that work on Babcock St. would be deferred until 2016, avoiding near-term confrontations on the issue. This entry was posted in Neighborhoods, Parking, People, Regulations, Transportation on June 10, 2015 by Craig Bolon. Unlike last year, Brookline’s 2015 annual town meeting rolled along at a brisk pace and needed only two sessions–Tuesday, May 26, and Thursday, May 28–both starting at 7 pm in the High School auditorium. The generally progressive tones of Brookline civic engagement remained clear, and some of the musical theatre of years past returned for an encore. This is the one-hundredth year for Brookline’s elected town meeting. Budgets: Disputes over budgets that roiled the winter workups to town meeting had evaporated after voter approval of a major tax override at the Tuesday, May 5, town election. Edward “Sandy” Gadsby, the moderator of town meeting, mentioned “controversy” over a three-word amendment to one special appropriation. The Advisory Committee proposed two changes to the “override” financial plan as proposed by Mel Kleckner, the town administrator. In the traditional presentation of an annual budget, Sean Lynn-Jones, newly elected as chair of the Advisory Committee last winter, called 2015 “an interesting year.” He noted that new revenues were going to be involved in maintaining a stable budget, singling out parking meter and refuse fees. Mr. Lynn-Jones said he expects “fiscal challenges…another general override in three to five years…possibly a ninth elementary school…high school [expansion] at over $100 million, not $35 million,” as most recently estimated. Staff for preservation planning will increase from 1.8 to 2.0 full-time-equivalent positions, a budget hike of $14,119. It is expected to provide a full-time position for preservationist Greer Hardwicke. The Public Works budget for pavement markings got $2,673 more, to cope with after-effects from a harsh winter. Those had been wrapped into Advisory Committee motions. A $264 million spending plan sailed through, mostly on voice votes. A three-word amendment to a $100,000 special appropriation had been proposed by Craig Bolon, a Precinct 8 town meeting member who edits the Brookline Beacon. Offered on behalf of Brookline PAX, it asked that a study of Coolidge Corner parking be done “with neighborhood input.” Town meeting agreed in a unanimous voice vote. Instead of parochial concerns with Public Works, this year’s town meeting focused more on the Police budget. Lynda Roseman, a Precinct 14 town meeting member, asked about progress coping with mental health issues. Daniel O’Leary, the police chief, compared last year–when three members of the force were involved–to this year, when two grant-funded programs are underway. By the end of the year, he said, about a quarter of the force will have completed 40 hours of training. A large municipal solar-power array, in effect a budget item, was approved out-of-line under Articles 15 and 16. Brookline is contracting with Blue Wave Capital, a company endorsed by the Metropolitan Area Planning Council, which is to build and operate it, using part of the former landfill site near the waste transfer station off Newton St. Rated capacity is to be 1.4 MW, peak. Expected income is about $0.08 million per year. Bylaw, Living Wage: Under Article 10, the Recreation Department proposed to gut much of the Living Wage bylaw enacted several years ago, by exempting from coverage several employee groups and by eliminating the Brookline minimum wage: a one-dollar premium over the state minimum. Patricia Connors, a Precinct 3 town meeting member who was the chief sponsor of the bylaw, had resisted the effort strongly. Town meeting members sided strongly with Ms. Connors, Merelice and Brookline PAX. In an electronically recorded vote, the Connors amendment passed 141 to 48, with 10 abstentions. The amended main motion on Article 10 passed 144 to 42, with 5 abstentions. Although the Brookline minimum wage premium is maintained, so-called “junior” employees in the Recreation Department will no longer be covered by the Living Wage, reverting to the Brookline minimum wage–currently $10.00 versus $13.19 per hour. Recreation claims to be able to support more positions. Bylaw, snow clearance from sidewalks: Town meeting grappled with the latest edition of a snow-clearance bylaw under Article 12. For about 30 years a bylaw initially proposed by Stanley Spiegel, a Precinct 2 town meeting member, has required property owners to clear adjacent sidewalks of snow. However, until a push last year from Frank Caro, a Precinct 10 town meeting member who filed a resolution article, and from the Age-Friendly Cities Committee, enforcement proved erratic. During the 1970s and before, Brookline plowed most of the sidewalks, but after budget trims in the aftermath of Proposition 2-1/2 it cut back to only a few, including ones near schools. Article 12 was proposed by a Sidewalk Snow Removal Task Force, appointed in the summer of 2014 by the Board of Selectmen to strengthen the town’s law and its enforcement. The group–including staff from Public Works, Health, Building and Police–acknowledged that a complaint-driven approach had worked poorly. Last winter, the four departments contributing to the task force divided Brookline’s streets into four sectors and began proactive enforcement during weekdays, with Police assuming most duties at other times. Despite the unusually harsh winter, enforcement generally improved, as described to town meeting by Nancy Daly, speaking for the Board of Selectmen. However, Martin Rosenthal, a Precinct 9 town meeting member, pointed out the lack of coordination in the current form of enforcement. In its town-meeting article, the task force proposed to discontinue automatic warnings for first violations at residential properties, to raise fines and to institute a $250 fine for placing snow into a street–forbidden by Brookline’s general bylaws since the nineteenth century. Compromises made as outcomes of several reviews had gutted most of the original proposal, leaving relatively weak enforcement, modest fines and no administrative appeals. Tommy Vitolo, a Precinct 6 town meeting member, offered two amendments intended to address some compromises. One would have limited a period of enforcement delay, at discretion of the public works commissioner, to no more than 30 hours after the end of a snowfall. Amy Hummel of Precinct 12, speaking for the Advisory Committee, objected to an arbitrary time limit for the commissioner’s discretion. During the Blizzard of 1978, many streets remained impassible for several days, because Brookline then lacked much equipment capable of clearing them. That amendment was rejected through an electronically recorded vote, 78 to 108, with 6 abstentions. Dr. Vitolo’s other amendment sought to restore the schedule of fines that the task force had proposed. Those called for a $50 fine on a first violation at a residential property, rather than an automatic warning, and a $100 fine for subsequent violations. Dennis Doughty, a Precinct 3 town meeting member who served on the task force, supported the amendment on fines. He compared hazards of sidewalk snow with other hazards now sanctioned by $50 fines and no warnings, including putting refuse out for collection earlier than 4 pm the previous day. Town meeting members approved the amendment on fines through an electronically recorded vote, 135 to 52, with 5 abstentions. However, according to the main motion, revised penalties are stated again in Article 10.3 of the bylaws, Table of Specific Penalties. What Dr. Vitolo’s amendment did was to revise penalties stated in the bylaw on snow clearance but not those stated in the Table of Specific Penalties. There will likely be no more snow before a fall town meeting, which might make the Brookline bylaws consistent. Bylaws, tap water and bottled water: Articles 13 and 14, the two “water articles,” had been filed by Jane Gilman, a Precinct 3 town meeting member, Clinton Richmond, a Precinct 6 town meeting member, and several other petitioners. Both were “watered down” during reviews before the town meeting, yet significant parts of each survived and won approval. Ms. Gilman and Mr. Richmond are co-chairs of the “green caucus” in town meeting, which counts over fifty town meeting members as participants and has been effective at marshaling votes for some recent, environmentally oriented initiatives. Brookline PAX, with a somewhat overlapping base of support, was recommending voting for motions offered by the Board of Selectmen in favor of parts of the two articles. Article 13 sought a bylaw requiring Brookline restaurants to offer tap water. They already do, said Sytske Humphrey of Precinct 6, speaking for the Advisory Committee. She called the proposed bylaw “unnecessary and ineffective.” However, the petitioners had found some sinners. An Indian restaurant in Washington Square did not offer tap water on its take-out menu, and one pizza place did not seem to offer it at all. Diana Spiegel, a Precinct 2 town meeting member, said the topic could be handled by conditions on restaurant licenses and moved to refer the article to the Board of Selectmen. In an electronically recorded vote, the referral motion failed 78 to 103, with 5 abstentions. The motion for a bylaw drafted by the Board of Selectmen passed 124 to 56, with 7 abstentions. Article 14, seeking to ban sale and distribution of bottled water at town events and on town property, encountered stiffer headwinds at reviews before town meeting and quickly lost altitude. According to Mr. Richmond, the purpose was not banning water but banning the plastic bottles usually supplied. Hundreds of billions a year are sold. While they might be recycled, at least in part, they are mostly thrown away. By town meeting, motions under the article had been trimmed back to a proposed ban on spending town funds to buy water in plastic bottles of one liter or less for use in offices. The Board of Selectmen proposed to refer the rest of the article to a study committee, to be appointed by the board. The Advisory Committee stuck with its original approach, recommending no action. Robert Miller, a Precinct 8 town meeting member, asked whether the town was spending money on either bottled water or bottled soda. The answers were yes as to both, according to Mel Kleckner, the town administrator. Echoing a topic heard often during reviews, Jonathan Davis, a Precinct 10 town meeting member, asked whether vending machines on town property would be affected. Mr. Richmond conceded they would not be, since “the machines are put out to bid” and do not involve spending town funds. Mr. Gadsby, the moderator, took a motion for the question–that is, a motion to terminate debate. Not enough town meeting members were ready to do that. On an electronically recorded vote the motion failed 129 to 71, with 2 abstentions. Such a motion takes a two-thirds margin but got only 65 percent. After hearing similar opinions from a junior at Brookline High School, Mr. Gadsby again accepted a motion for the question. He declared it had passed, on a show of hands. The motion from Mr. Harris to refer all of Article 14 failed on an electronically recorded vote, 97 to 102, with 2 abstentions. The motion from the Board of Selectmen for a bylaw banning some uses of town funds passed by a substantial majority, on a show of hands. Resolution, recreation land: Article 18 proposed a resolution seeking a study of acquiring land in the Putterham neighborhoods of south Brookline for park and recreation uses–specifically, so-called “buffer” areas of Hancock Village near Beverly and Russett Rds. Regina Frawley, a Precinct 16 town meeting member, and Hugh Mattison, a Precinct 5 town meeting member, prepared the article. Although not an abutter to Hancock Village, Ms. Frawley has lived nearby since 1968. While it is possible that the current landowner, Chestnut Hill Realty, might agree to sell the land, a series of development plans, currently tapping powers under Chapter 40B of the General Laws, have left the company at loggerheads with the Board of Selectmen. A purchase-and-sale agreement now looks unlikely, so that Ms. Frawley suggested the land would probably have to be taken by eminent domain. In the Putterham neighborhoods, Ms. Frawley showed, there is little public open space. She described the current open spaces and showed that the Hancock Village buffers look to be the largest undeveloped areas likely to be suitable. The only sizable public spaces now are around Baker School. They are laid out for specialized uses and are unavailable to the public during school days. For over 70 years, neighborhood residents have often used the buffer areas for recreation instead, as tolerated by a succession of landowners. Moderator Gadsby immediately took comments from Rebecca Plaut Mautner, a Precinct 11 town meeting member, ahead of normal order and before hearing from the Advisory Committee and town boards. He did not explain the unusual conduct. Ms. Mautner operates RPM Consulting, according to the Web site of Citizens’ Housing and Planning Association in Boston–providing “affordable housing development services” in New England. Ms. Mautner delivered a broadside against Article 18, saying it “will be perceived by the outside world as an effort to undermine creation of affordable housing…a message that Brookline will stop at nothing to prevent affordable housing.” That did not seem to resonate well, broached in the first town in Massachusetts to build public housing, where inclusionary zoning has been active for over 20 years. Lee Selwyn of Precinct 13, speaking for the Advisory Committee, recalled that the proposed “Hancock Village project did not start out as 40B…there was no affordable housing in the original plan.” The owner, he said, is “using 40B as a means to pressure the town.” He said Article 18 proposed “a reasonable public use” of land, and he noted that a parcel adjacent to Hancock Village had been “taken by the state by eminent domain to prevent an inappropriate development.” The Hancock Woods area was taken as conservation land about 20 years ago. Janice Kahn of Precinct 15, also an Advisory Committee member, supported the study. She said it could teach the town about using eminent domain. There has been no substantial taking since the Hall’s Pond and Amory Woods conservation projects in the 1970s. Given the ongoing disputes with Chestnut Hill Realty, the Board of Selectmen had declined to take a position on Article 18. Members had said they would abstain from voting on it. Mr. Mattison of Precinct 5, a suppporter, said the buffer “space has served as informal recreation space.” Some 1940s correspondence with the town, he said, describes “how the commitment would be binding” to maintain it as open space. However, that was not part of an agreement presented to a 1946 town meeting, when the bulk of Hancock Village was rezoned to allow apartments. Crossing the rotary and the VFW Parkway with young children seemed too dangerous, Ms. Jette said, and she had never tried. However, she said, “yards are not a substitute for social and community opportunities. It’s time to create a true neighborhood park in south Brookline…Time is of the essence, given Chestnut Hill Realty development plans.” After a few other comments, town meeting approved Article 18 on a show of hands, looking like a ten-to-one majority at least. Resolution, Boston Olympics: Article 19 proposed a resolution, objecting to plans for holding the Olympic Games in Boston during 2024. The plans never gained traction in Brookline, where many people see heavy costs and slender benefits. The Board of Selectmen had nevertheless postponed making a recommendation, reaching out to the pressure group pushing for the Olympics, but no one from that group responded. At the town meeting, Martin Rosenthal, a Precinct 9 town meeting member, led off–speaking for Brookline PAX, of which he is co-chair. Unlike his fellow co-chair, Frank Farlow of Precinct 4, Mr. Rosenthal said he is a sports fan and “was excited at first.” However, he had realized “there might be some issues here…it was more for the benefit of non-Brookline people.” PAX opposes plans for 2024 Olympic Games in Boston. Christopher Dempsey, a Precinct 6 town meeting member, was giving no quarter. He has co-founded a volunteer group, No Boston Olympics, and was on the warpath, armed with PowerPoint slides. The pressure group behind the Olympics plans, he said, is aiming to raid public funds. A long article published the previous day in the Boston Business Journal revealed much of that story to the public. According to Business Journal staff, previously secret sections of the Olympics “bid book” said public money would be sought to “fund land acquisition and infrastructure costs.” The plans were also “relying on an expanded Boston Convention and Exhibition Center”–a deluxe Patrick administration venture that the Baker administration has canned. Mr. Dempsey was having a field day, saying, “Boston 2024 is not going to fix the T…In London and Vancouver the Olympics Village financing was from public funds…Olympics budgets are guaranteed by taxpayers…The more you learn about 2024 Olympics, the less you like it.” Ben Franco spoke for the Board of Selectmen, simply stating that the board “urges favorable action” on Article 19. Most town meeting members were not convinced by such claims. They approved the resolution in an electronically recorded vote, 111 to 46, with 7 abstentions. Katherine Seelye’s story in the New York Times on Saturday, May 30, may have deep-sixed the Olympics plans. She included the Business Journal disclosures and cited the Brookline town-meeting resolution. Other actions: Under Article 9, town meeting voted no action on a proposal to make holders of state and federal offices living in Brookline automatic town meeting members. After encountering opposition, Ernest Frey, a Precinct 7 town meeting member, offered a “no action” motion on the article that he and other petitioners had submitted. Article 17 proposed a resolution seeking changes to Sections 20-23 of Chapter 40B, the Comprehensive Permit Act of 1969 that was encouraged by the late Cardinal Cushing. Nancy Heller, the principal petitioner, now a member of the Board of Selectmen, had not seemed to recognize the complexity of the issues and soon agreed to refer the article to the Planning Board and Housing Advisory Board. That was the course taken by town meeting. Under Article 11, town meeting voted to create a Crowninshield local historic district, on petition from the owners of about 85 percent of the houses on Crowninshield Rd., Adams St., Elba St. and Copley St. Speaking in favor were David King, chair of the Preservation Commission, Robert Miller, a Precinct 8 town meeting member, George White, a Precinct 9 town meeting member, John Sherman and Katherine Poverman, both residents of Adams St., Angela Hyatt of Precinct 5 for the Advisory Committee and Nancy Daly for the Board of Selectmen. Dr. White recalled that the neighborhood had been home to well-known writers and artists. He mentioned novelist and short-story writer Edith Pearlman, an Elba St. resident for many years, and after a little prompting the novelist Saul Bellow, winner of a Nobel Prize in literature, who lived on Crowninshield Rd. in his later years. Only Clifford Ananian, a Precinct 10 town meeting member, took exception. He said preserving “single-family homes is a waste of a valuable resource,” although he lives in one of those homes. Despite the objection, the town meeting vote to create the district proved unanimous. This entry was posted in Business, Development, Elections, Environment, Events, Grade schools, High school, History, Housing, Information, Meetings, Neighborhoods, Parking, People, Projects, Public health, Regulations, Services, Sports, Taxes, Traffic, Transportation on May 30, 2015 by Craig Bolon. If you’re curious to see what suburban-oriented government looked like in the 1950s and before, visit the Transportation Board–where it can sometimes seem as though antique outlooks have been preserved in amber. Within the past week–at public meetings of two of the town’s many other boards, commissions, committees and councils–some members complained openly about unresponsive behavior. Complainers even included a member of the Board of Selectmen, which appoints members of the Transportation Board. Launching a board: Oddly enough, the Transportation Board had been launched as a reform against arrogance, or so some people said at the time. Since the emergence of motor vehicles in the early twentieth century, Brookline struggled with regulation. Under Chapter 40, Section 22, of the General Laws, town meetings may enact bylaws and boards of selectmen may adopt “rules and orders” concerning traffic and parking. The workload of regulating motor vehicles soon became too much for the Board of Selectmen in Brookline. During the 1920s, it delegated work to a Traffic Committee consisting of four department heads and the chairs of the Board of Selectmen and Planning Board. A surge in automobiles after World War II challenged that approach. The fall town meeting of 1973 again petitioned for legislation: this time to create a Transportation Department–more recently the Transportation Division in the Department of Public Works–and a volunteer Transportation Board. So far, the arrangements under a 1974 law have held. Under that law, the Board of Selectmen acts as an appeals board, and appeals have been rare. One could be coming soon, though. Building a peninsula: The intersection where Buckminster and Clinton Rds. join just west of the High School has often been seen as a safety issue. Drivers may careen through without seeming to look and sometimes without stopping at the single stop sign, found when coming into the intersection from Clinton Rd. Heading the other way, downhill on Clinton Rd., drivers can easily exceed the posted 30 mph speed limit. One classic method to slow the speeds is a traffic island, making drivers dodge around. More modern, so-called “traffic calming” might use a raised intersection, “speed bumps” or “curb bulbs.” Apparently, none had looked to Brookline’s current engineers like the right approach. Instead, they had sold the Transportation Board a giant peninsula, blooming out the sidewalk from the northeast sides of Clinton and Buckminster Rds. at the junction. 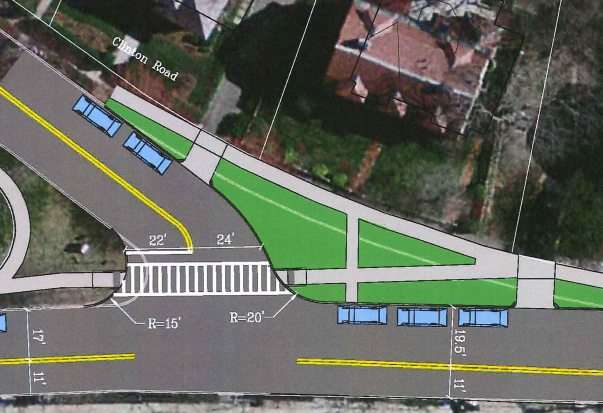 Daniel Martin, a Brookline engineer, called it a “curb extension”–clearly a highly extensible phrase. Of course, any change to a residential street is also a change to someone’s home. The home nearest the giant peninsula is 79 Buckminster Rd. Its owners are not pleased, to say the least. From their viewpoint, the huge peninsula would leave their lot “landlocked” without street frontage. It might work technically only because they now have a garage beneath the back of the house, reached by a driveway shared with their neighbors at 3 Clinton Rd. Were they to install a conventional driveway, somehow it would have to invade the peninsula. Compared with alternatives, the peninsula plan looks like costly efforts invested for cloudy results. Several years ago, similarly costly measures on Winchester St. slowed speeding only within around a hundred feet from obstacles. Unless something more is done, Ms. Meyers, who lives quite a bit farther than that from the intersection at issue, is not likely to see much improvement. In the past, Transportation sometimes waxed less bureaucratic and became more effective. Instead of seeing roadblocks in its path–claiming you can’t do this and you can’t do that–it did the impossible anyway. In North Brookline, an alert observer can find 25 mph posted speed limits and intersections with stop signs on the wider street rather than the narrower one. Those were inexpensive, practical solutions to vexing problems. On May 21, however, certifiable experts certified nothing more could be done, and the vote went 2 to 4 against reconsidering the peninsula plan. Only board members Ali Tali and Pamela Zelnick voted in favor. At other places and in other times, such events became subjects of land damage lawsuits, but Brookline offers a further course: administrative appeal. If the owners of 79 Buckminster Rd. carry an appeal, they will be dealing with the Board of Selectmen. Its newly chosen chair, Neil Wishinsky, recently told another group, “My political thinking is to stay away from parking.” For much of the last 90 years, Mr. Wishinsky would have found kindred spirits on his board, but now such duties come with the job. Taxi rules: After negotiations with taxi owners, Todd Kirrane, Brookline’s transportation administrator, brought in a substantially revised draft of new rules. The changes tend to lower the added costs to taxi companies but will also provide lower standards of service. A key point of dispute has been new requirements for vehicles with ramps for people who use wheelchairs. The revised draft has vague and inconsistent language. In some places, it speaks of “ramped taxicabs,” saying they might also provide a “lift.” In others, it refers to “WAV taxicabs”–never defining that but apparently meaning “wheelchair-accessible vehicle.” It’s unclear whether a “ramped taxicab” will necessarily be a “WAV taxicab” or vice-versa. Possibly the regulations did not undergo legal reviews. As first proposed, the rules required one “ramped taxicab” for every ten licensed vehicles. Operators objected to the extra costs, some saying they got no requests for such vehicles in as much as ten years and probably would never get any. Members of the Commission for the Disabled have called that a self-fulfilling prophecy, since word had gotten around that there were no such Brookline taxis. Mr. Kirrane stated that Boston now has a standard of one “WAV taxicab” for every 18 licensed vehicles. In Brookline, the revised draft called for one “ramped taxicab” for every 25 licensed vehicles. Saralynn Allaire, a Precinct 16 town meeting member and a member of the Commission for the Disabled, asked how the rule would be implemented. Mr. Kirrane said the rule would come into effect July 1 of next year and would not apply to a company with fewer than 25 licensed vehicles. The board reviewed a perennial controversy: a limit on the number of licensed taxis. At least two members of the board–Joshua Safer, the chair, and Ali Tali–seemed to favor what one called a “market system,” with no limit. The revised draft proposed a limit of two licensed taxis per 1,000 Brookline residents. Brookline’s population map, based on the 2010 federal census, shows 58,732 residents–indicating 117 taxi licenses. Board member Christopher Dempsey criticized the limit, saying it was “picked out of the air” and that “a population metric is not a very effective one.” He offered no other approach. His motion to strike the metric failed on a 1-4-1 vote, with board member Scott Englander abstaining. The board adopted the revised taxi rules, effective July 1, by a unanimous vote. After the meeting, Joe Bethoney, owner of Bay State Taxi, Brookline’s largest company, confirmed that he planned to continue in business under the new rules. This entry was posted in Business, History, Licensing, Meetings, Neighborhoods, Parking, Projects, Regulations, Traffic, Transportation on May 23, 2015 by Craig Bolon. A meeting of Brookline’s Complete Streets Study Committee on Monday, May 11, started at 7:10 pm in the first-floor north meeting room at Town Hall. All the current members except Thomas Vitolo were on hand for the first full review of a policy statement. Background: The somewhat vague phrase “complete streets” was adopted in 2005 by an eponymous coalition–mostly planners and architects–promoting facilities for pedestrians, bicyclists and public transit riders as effective as those for motorists. The national coalition since found some institutional housing inside a group called Smart Growth America based in Washington, DC. Smart Growth America does not disclose its form of organization, finances or commercial sources of support. It offers consulting services for “policy development,” for “coalition building” and for organizing “specific populations: older adults, children, low-income, people with disabilities.” In Massachusetts, it lists as apparently dues-paying members the Conservation Law Foundation, Massachusetts Smart Growth Alliance and Metropolitan Area Planning Council but not any individuals, businesses or trade groups. Legislation:For the 2013 and 2014 sessions of the General Court, state Sen. Harriette L. Chandler of Worcester, a member of rules, ethics and housing committees recently named majority leader, sponsored S.68, “An act relative to active streets and healthy communities.” It sought to create a “complete streets program” in Massachusetts. Then-Rep. Jason M. Lewis of Winchester sponsored H.3091, a companion bill. The Massachusetts Public Health Association took a lead role in promoting the bills. Health research had shown for years that people who regularly walk or bicycle enjoy significant health benefits. It was joined by the Metropolitan Area Planning Council and by advocacy groups representing bicyclists and pedestrians. Sen. Chandler’s bill defined “complete streets” to mean “streets that provide accommodations for users of all transportation modes, including but not limited to walking, cycling, public transportation, automobiles and freight.” S.68 died in the Ways and Means Committee, but Sen. Chandler prevailed on March 6, 2014, with a floor amendment to the transportation finance bill, then S.2023. The S.2023 bill was carried into H.4046 and enacted April 18 as C. 79 of the Acts of 2014. That created Chapter 90I of the General Laws, “Complete streets program.” Its definitions are the same as those in Sen. Chandler’s original bill. The April 18, 2014, law provided $5.5 million in earmarked funds and $50 million in competitive grant funds. Progress: On May 8, 2014, Mayor Curtatone and the Somerville Board of Aldermen enacted the first municipal Complete Streets program in the state. Other communities–including Framingham, Hudson and Newburyport–had adopted executive policies earlier. Since 2011, the Massachusetts Municipal Association has offered a model policy for such uses to its member communities, which include Brookline. At least 20 Massachusetts communities have now enacted Complete Streets programs, following Somerville’s lead, and many others have adopted executive policies. A policy need not be complex. For example, last September the Transportation Commission for the City of Waltham adopted a policy consisting of only 207 words that fits on half a sheet of paper. Brookline activity: In Brookline, a Complete Streets effort has been led by Scott Englander, a mechanical and energy engineer and a member of the Transportation Board. The approach he developed was to set up a committee to consider and propose a Complete Streets policy to a future town meeting. Implementation of the policy would be carried out mainly by the Transportation Board and Department. The Board of Selectmen approved a charge to a new Complete Streets Study Committee on September 30, 2014, and appointed members of the committee on December 17. Board member Neil Wishinsky became liaison to the committee, and he and Mr. Englander serve as co-chairs. In a few places, the committee has been called a “task force,” but unlike a typical task force it includes no members of town staff, and it has duties that continue beyond developing a policy. Those include confirming a baseline inventory of pedestrian and bicycle facilities, developing procedures for town projects involving streets and reviewing town standards for private development. Policy proposal: At the Monday meeting, members reviewed a draft apparently prepared by Mr. Englander along with at least committee members Mitch Heineman and John Bowman. Several other members were said to have made changes through comments. The draft had been conveyed to the Board of Selectmen on March 31. Paper copies were available at the Monday meeting, but the document has not yet appeared on the municipal Web site. In contrast to the 207-word Waltham policy, the Brookline draft was, as of Monday, five pages of single-spaced fine print, probably around 3,000 words. Committee members went through its six sections, one by one. The flavor might be suggested by one of the nine proposed “design guidance” elements from Section 4 (as numbered on May 11). Mr. Wishinsky, representing the Board of Selectmen, observed, “My political thinking is to stay away from parking.” As to the many directives and prescriptions in the draft, he said that the “document needs to recognize some realities…each one of those things is quite an involved task.” The committee is to send comments to Mr. Englander and meet again in a week. This entry was posted in Environment, History, Parking, Projects, Public health, Transportation on May 12, 2015 by Craig Bolon. At least half a dozen times since World War II, Coolidge Corner merchants and property owners pestered the town to build them some free parking–free to them, that is. So far, they landed two bonanzas: the Beacon St. median spaces in the 1940s and off-street, open-air parking lots in the 1960s. Brookline took properties by eminent domain and demolished houses to create and enlarge open-air parking. Recently, merchants and owners have been maneuvering again for a free parking garage–free to them, of course. There are five off-street, open-air public parking lots close to Coolidge Corner: Centre St. east with 143 public spaces, Babcock St. with 65 spaces, Centre St. west with 56 spaces, John St. with 14 spaces and Webster St. with 13 spaces. A professional analysis in 2007 found 1,141 metered public spaces serving the Coolidge Corner business area. There are hundreds more unmetered public spaces on the smaller nearby streets. 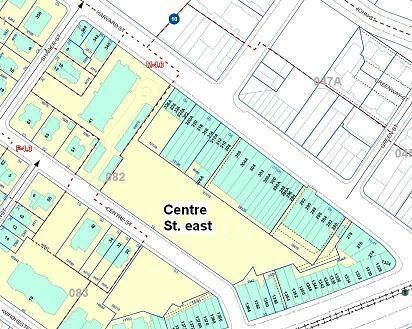 Envelope: The only large and obvious location for a parking garage is the Centre St. east lot, behind the S.S. Pierce building, the Coolidge Corner Theatre, the Arcade building and 1-story buildings along Harvard St. It has a trapezoidal shape with wide connections to Centre St. and one-way connections to Harvard St. at each end. There are five herringbone rows of 25 to 30 angled spaces each. It is Brookline block 82, lot 14, with 81,912 sq ft, shown on page 16 of the 2010 Brookline Atlas. The Centre St. east parking lot is currently zoned G-1.75 (CC), a designation used only in the Coolidge Corner business area. The envelope for parking is set by Table 5.01 and Sections 5.06.4b, 5.21 and 6.02 of Brookline’s zoning bylaw. Stretched to the maximum, these appear to allow a 4-story garage measuring about 395 by 105 ft, positioned over the current, outer parking rows and leaving an open corridor about 50 ft wide at the narrowest, running between the garage and the existing Harvard St. buildings. This approach uses the approximately triangular area at the end near Beacon St. as open space, counted as such for zoning purposes. The corridor would be eligible for use as open-air parking. At an efficiency of 320 sq ft per stall, typical of medium-size garages, the Centre St. east garage could house about 520 spaces. At 12-foot average intervals, the corridor could house about 30 more spaces, handicapped-accessible. That could provide about 550 public parking spaces in all, compared with the current 143. One likely construction technique would use long-span girders and decks. At a spacing of about 11 ft per deck, even with a full roof the total height should be less than the 45 ft allowed under zoning. Such a plan would probably not need a zoning variance and might need only a special permit for design review–common at the Planning Board and Zoning Board of Appeals. At costs per stall for recent projects in dense, urban areas with union wages, construction might be priced somewhere in the neighborhood of $15 million. Urban blight: Parking garages have become icons of urban blight. The former 4-story garage in Post Office Square endured such a fate. 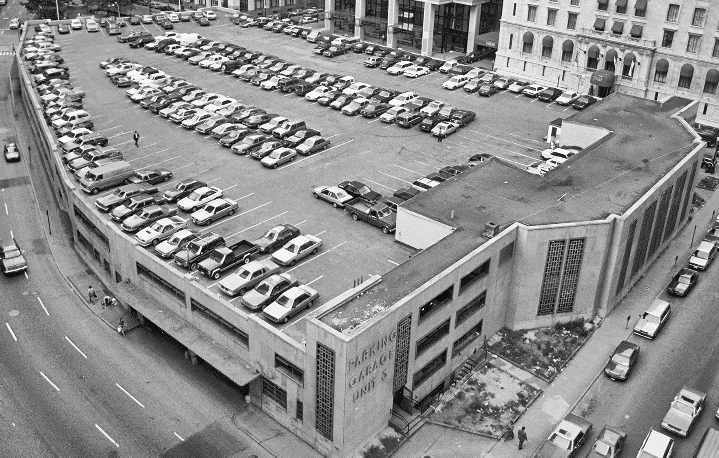 Built by the Hynes administration–which also demolished the entire West End and buried the Muddy River in culverts under Park Drive–the ugly, concrete garage in Post Office Square was razed after less than 35 years and replaced by Leventhal Park. There is no way to hide such a monster above ground. Make it only two stories or three stories, and it becomes more costly per space and merely a smaller monster. Put it underground, and the cost goes up 40 to 100 percent, depending on ground conditions. The successful sponsor of an urban parking garage is bidding to become a public enemy, loathed and vilified for generations. This entry was posted in Business, Environment, History, Neighborhoods, Parking, Projects on May 4, 2015 by Craig Bolon.